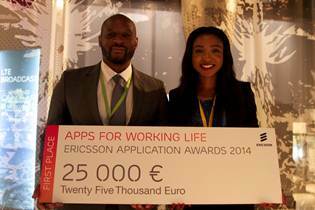 Ericsson (NASDAQ:ERIC, news, filings) has today announced the winners of the 2014 Ericsson Application Awards at a ceremony held at the Ericsson Studio in Kista, Sweden. The Student category was won by Team WorkMode from South Africa for their collaboration app, with the Company category being won by Team SOP from Nigeria with their app that monitors electricity supply. Taking home the honors in the student category, Team WorkMode from South Africa created an app that helps workers collaborate by allowing them to see the real-time work context and tasks of colleagues. The jury motivated their choice by saying: "We felt that Team WorkMode showed a strong business potential, and their focus on design and usability helped them when it came to innovation and addressing the theme of Apps for working life." Jacques Marais of Team WorkMode says: "This award will help us to build our business and allow us to develop not only this app but also some ideas we have around education in South Africa. It will also enable us to purchase hardware so we can expand to different platforms. It's a real boost." The company category was won by Team SOP from Nigeria, who created an app that analyses the availability of electricity in a given area. The jury outlined their reasons for choosing SOP, saying in a joint statement: "Team SOP presented a strong case of using technology in a way that anyone could understand, value and would invest in. They cleverly combined consumer, society and business benefits around lifting transparency of power delivery in a well designed package." Toks Ogun of Team SOP says: "This award means we can continue to expand and develop our app, which monitors electricity supplies. We can see a market in parts of North America, in South America and in India and we will continue to develop our idea." The Technology for Good Recognition also went to Africa, with Sowertech's Afta Robot app receiving the award for their smart solution for public transportation. The jury motivated their choice by saying: "Every day 15 million people in Africa face long walks and sometimes longer waits as they make their daily journeys by taxi. Sowertech has helped connect taxis and their customers by providing information on location and much more through their AfterRobot mobile app." The winners were chosen from over 300 registered teams representing 63 countries from all over the globe. The company category attracted 158 entries, with 142 teams entering the student competition. Bina Chaurasia, Senior Vice President and Chief Human Resources Officer, Ericsson, says: "We would like to offer our congratulations to both teams, who faced hard competition from all over the world. At Ericsson we often talk about the Networked Society and how mobile and digital technologies are increasingly expanding into more areas of society, business and our private lives. The winning apps strongly reflect this trend, as well as this year's theme of 'Apps for Working Life.' We wish our winners every success in the future." 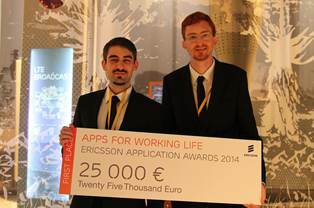 The Ericsson Application Awards is an annual competition for application developers, and this year's theme for the competition was "Apps for Working Life." The purpose was to promote innovations that will change how businesses are organized, as well as how we organize work, collaborate and share. The semi-finalist apps were reviewed by a panel of global representatives and they decided on the two winning teams, who will each receive 25,000 in prize money.